Pollution is to be prevented in the first place but even after prevention, pollution is often not fully eliminated. Pollution needs to be adequately treated before discharge so that the environment is not adversely affected. Take the case of managing wastewater. Industries generate wastewater from manufacturing processes, from utilities (boiler operations and cooling water discharges) and from sanitary use. One can reduce the wastewater generated by modifying the manufacturing process (e.g. using “dry” operations instead of “wet”) or by recycling wastewater back in the process, Wastewater after some treatment could also be used for washing or low grade operations All these efforts lead to wastewater flow and load reduction. The wastewater that is left over needs to be treated as an “end of the pipe measure” so that the stipulated wastewater standards are met. These standards are listed specific to pollutant concentrations by the regulator (such as Pollution Control Board) with a belief that if the standards are met then the receiving environment will stay protected. I have a problem in believing or trusting the above “system” of monitoring & enforcement. Firstly, the wastewater treatment plants are seldom operated by trained or certified operators. In India, we don’t have a requirement of certification so – “anybody” can operate a wastewater treatment plant. I am always intrigued by the fact that while industries do spend considerable capital expenses in building wastewater treatment plants, they simply ignore the plant operations and do not get skilled people to operate, or pay them well and provide them a career progression. Can you think of an operator getting a raise in salary because he operated the wastewater treatment plant in 24×7 compliance? How about an operator who could reduce the specific energy consumption (KJ/m3) of the wastewater treatment plant while remaining in compliance. This operator should be felicitated and paid a bonus proportional to the energy bill saved! This does not happen. While satisfactory operation of the wastewater treatment plant is an issue, the other problem is relatively low experience of the staff of the PCB in plant inspection and sampling. Most of the times, the staff (that is typically a field officer) is not well trained on how to walk through, inspect and assess the plant performance. The officer is sometimes not familiar with the treatment process or the equipment or does not hold a prior experience that has given him an eagle’s eye of inspection. So in most instances, the task of inspection and monitoring gets poorly performed. The brunt of non-compliance is then received by the environment despite investments made, staff deployed and numerous monitoring reports prepared! When he heard me, he said “Dr Modak, you have come to me at the right time. I have just completed a pilot project on wastewater treatment plant that speaks. Let us drive to one such pilot and you will see that all your concerns regarding treatment plan operations and inspection are resolved” He said this in a triumphant voice. In the next one hour, I drove with Professor to an inconspicuous mid-size activated sludge wastewater treatment plant (capacity 2 MLD) near Thane Belapur industrial area. As soon as we entered the gate, the gate greeted us saying “Welcome”. I was shocked to be welcomed by someone not “living” and in a machine voice. Professor smiled and said that he had activated the Speakoscope and now onwards I was going to hear “everybody” at the treatment plan who mattered. I was shocked to listen to this experienced and intelligent speech. “How does this oil & grease trap know about advanced use of biotechnology (enzymes)?” And I was still not able to accept the “fact” that the oil & grease trap was actually speaking. Professor smiled and said that this was essentially a combined application of Human Computer Interface (HCI), biomimicry and artificial intelligence. The main role was however played by Google-Intel microchips. These chips allow the humanoid of each treatment unit to surf on the web for seeking knowledge, upload data and download literature. He said that all treatment units in this plant are fitted with such special chips. I realized that the oil & grease unit (OG) had just smsed Professor the performance data of last 24 hours. Professor was generating infographics out of this data on his iPhone by plotting flow against incoming and outgoing oil and grease concentration. “Hmm” He said to himself. I thought that PST was right. Sometimes, basics like uniform level of the weir plate are not looked into. PST made other points such as the motor is not regularly serviced and overload alarm does not work. We moved to the Aeration Tank (AT). 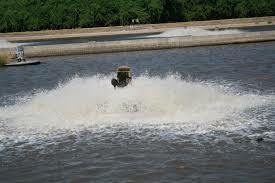 AT had four 50 HP floating aerators. When one of the Floating Aerators (FA) saw the Professor, he wobbled a bit and skirted towards the wall and yelled “Hey Professor, long time no see!” Of course only we heard this as we had the Speakophones. When Professor asked FA his point of view, the FA said that he spins generally in the day time, and especially runs in full speed with lot of foaming around when staff from PCB visits. Nights are cool however as no electricity is supplied. “I am quite happy as all of us get a good night sleep. But sometimes one of us is made to spin – just in case” The FA almost winked (i.e. flipped his blade a bit). I was shocked. Professor was able to “extract” real information on what was happening at the wastewater treatment plant by simply talking to the treatment units. What an intelligent inspection and monitoring technology I thought. We spoke to the Final Sedimentation Tank (FST), gathered information on the sludge bulking problem and then reached the Final Chamber (FC) of wastewater discharge. We found FC not very talkative and was kind of evading Professors questions. When Professor asked about the status on meeting with the standards i.e. compliance, FC changed the subject and started talking about climate change (Now a days I have been noticing that if you want to change the topic then most people start talking about climate change – so funny). “That’s not relevant FC. Come to the point of compliance” Professor growled. FC said that he cannot speak further as he has got a sour throat. When we exited the plant and reached my car, I could see that the Professor was visibly upset. I dropped Professor at the office of the Income Tax as he wanted to continue his research. Wow, ETPs / STPs personified!! Great reading. Fantastic style of narration to explain a complex issue of maintainance in an EFT. Good introduction of optimizing WWTP. Malady of such plants is due to outsourcing .Non-owning of the operation by once own personnel of competence and importance in the organization.PPP has to be demonstrated to make this happen.Rewards have edge over punishment. You hit on the nail.